It was a rainy day on Oahu today, the last day the whole family would be together on the island with Mom and Jackie flying back later in the evening. Jackie and I set out around 10a for the sunnier south side of the island, hoping to find better weather to let us hike something that Jackie wouldn't be hating on. It was raining on the south side of the Wilson Tunnel and still raining as we drove along Interstate H1 through Honolulu, making my first few options of ridge climbs a bust. We ended up at the SE tip of the island at Makapu'u Lookout, the first non-raining spot we found after almost an hour and a half of driving. I decided that we could do Makapu'u Head, an easy summit I'd done previously, but would have no mud even if it started raining. There is a road, not open to public vehicles and recently repaved in 2015, that is a very popular hike to Makapu'u Point, about as easy as it can get at about a mile, one-way. 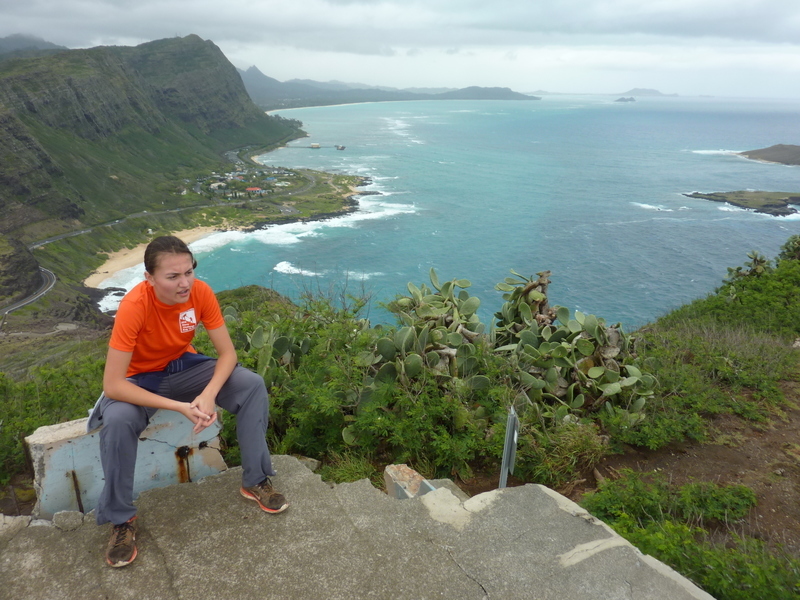 We did the more sporting option of hiking directly up to the highpoint from Makapu'u Lookout, found at the saddle where the road drops down to the windward side of the island. There is a pillbox disguised as lava rocks just above the lookout that we investigated before scrambling up to the highpoint on a convenient use trail. After checking out more WWII pillboxes at Makapu'u Head, we dropped down to the popular trail to catch the view from Makapu'u Point before taking the road back, making a loop of things. On the way down the road we stopped at the telescope viewing point (for whale watching, but saw none today) to investigate a small prominence off the road with yet another pillbox. While we were on this last point, Jackie took a call from a guy friend who was having girlfriend problems. I could only hear half of the conversation but it wasn't hard to figure out he wants to break up with his girlfriend without hurting her. It was worse than that, really, because he's kind of girly himself in that he needs to talk out all his feelings. His girlfriend is similar and feels she's not getting enough emotional attention either. How pathetic, I thought - two narcissistic millennials aren't getting enough me time. I told Jackie to tell him to grow a pair and break up with her already. For some reason, my sage advice was completely disregarded. Kids.